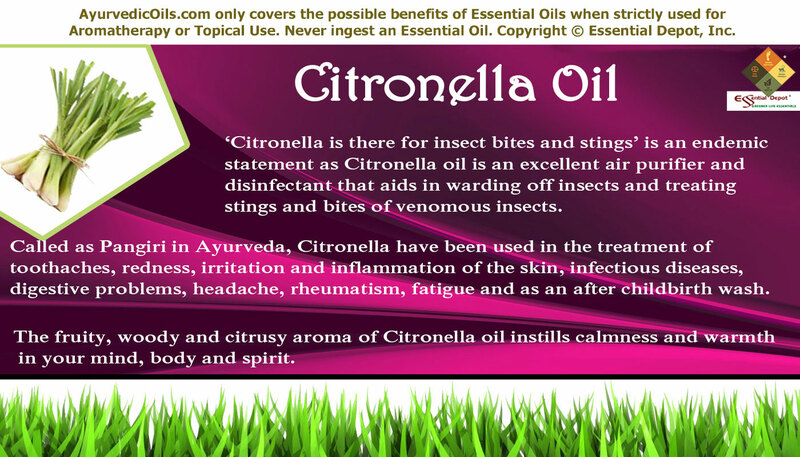 ‘Citronella is there for insect bites and stings’ is an endemic statement and is a realistic one as well, as the essential oil of Citronella is an excellent air purifier and disinfectant that aids in warding off insects and treating stings and bites of venomous insects also. The lemony, warming and sweet smelling Citronella oil is extracted from its aromatic grassy leaves by steam distillation. Scientifically known as Cymbopogon nardus, this aromatic herb is called as Pangiri in Ayurveda and have been used in this ancient healing system in the treatment of toothaches, redness, irritation and inflammation of the skin, infectious diseases, digestive problems, headache, rheumatism, fatigue and as an after childbirth wash. Native to Southeastern parts of Asia, especially Sri Lanka; Citronella is a member of the plant family Poaceae. It is also grown widely as a commercial crop in Java Islands, Indonesia, Burma, India, West Indies, Taiwan, Madagascar and Ceylon. This perennial grass variety is loved all over the world for its enticing lemon aroma and its blue-green leaves that grow up to a height of 1.5 meters tall. The Ceylon variety is considered to be the best and is called as Maha pengeri in Ceylon. Citronella and its essential oil have been in use for more than thousands of years and were used as one of the oldest effective insect repellent even before the manufacturing of insect repellents like DEET. This essential oil is used in the manufacturing of soaps, perfumes, detergents, insecticides, soap flakes and household cleaners. It was used in traditional medicine for treating menstrual problems, increased perspiration, mental fatigue, depression and as a safe repellent for pets. According to the Gas chromatography report, Citronella oil constitutes of 15 chemical components that contribute to its fragrance, therapeutic attributes, consistency and quality of this oil. 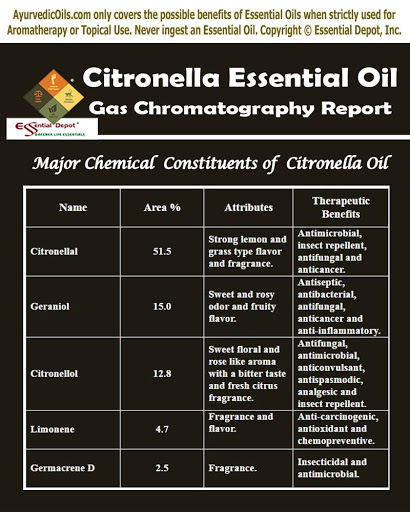 Of which, Citronellal contributes to the highest proportion of Citronella oil constituents with about 51.5% of its total composition. I trust that this must certainly help you in getting to know the exclusive information about the prime chemical constituents of Citronella oil. The table crafted below clearly depicts the unique nature and contributions of these bio-chemical constituents to the healing magnificence of Citronella essential oil. These constituents contribute to its remedial properties like bactericidal, diaphoretic, insecticidal, antioxidant, antiseptic, deodorant, stimulant, antifungal, tonic, relaxant, parasitic, antispasmodic and anti-inflammatory. Ayurveda is a mighty ocean enclosing mammoth health benefits for humanity. More than anything else, an Ayurvedic system teaches you absolute discipline to lead a hale, hearty and disease-free life for attaining longevity through healthy aging. Ayurveda simply means the ‘knowledge of life’ and the first thing that Ayurveda insists is to have a thorough knowledge about oneself. Health according to this noble science is a three-dimensional array that comprises of physical, mental and spiritual health. Everything on earth including the living and non-living things are a part of nature and are made up of the same five elements that Mother Nature is created with. They are space, fire, water, earth and air. The uniqueness in Ayurveda lies in its remedial methodology that treats individuals rather than their illnesses; it focuses on the root cause of an illness rather than its symptoms; it follows a unique treatment methodology for every person even with the same illness rather than following the ‘one-size fits all’ strategy. Every individual is a unique representation of nature with a specific individual constitution, comprising of three vital biological energies called as doshas. Each of this energy is a combination of any two vital elements and these dynamic energies determine the personality, behavior, physical and mental makeup of a person. Vata is a fundamental energy of air and space and is responsible for circulation and nervous functions of the body. Pitta is a basic force of fire and water and is accountable for body temperature and metabolic functions. Kapha is a dynamic force of earth and water and is in charge of the physical structure, movement of fluids and sustenance. Ayurveda identifies this innate presence of doshas and prescribes natural remedies in such a way to treat doshic imbalances, which would otherwise lead to diseases. The most predominant natural Ayurvedic remedies are essential oils, herbs, yoga, simple physical exercises, meditation, Ayurvedic routine, Abhyanga or Ayurvedic massaging and prayers. Essential oils are the life energy of plants and are a potential Ayurvedic remedy for treating mankind through the sense of smell and sense of touch. Citronella essential oil is known for lessening excess of pitta and kapha dosha and has a neutral effect on vata energy. Citronella essential oil is the most popular natural remedy for treating insect stings and bites and is also a potent insect repellent to keep away insects like mosquitoes, flies, ants and ticks. It has been registered in the United States since 1948 for this purpose. Citronella oil has been regarded as biopesticide with a non-toxic action by the United States Environmental Protection Agency. It is also considered as a natural alternative to chemical-based insect repellents like DEET. Adding 2 to 3 drops of Citronella oil in your air freshener, diffuser or vaporizer can assist in repelling insects. As it has been marked as generally recognized as safe (GRAS) by the United States Food and Drug Administration, Citronella oil can also be used to prevent flea infestations on your pets. Mixing 5 drops of Citronella oil to 10 ml of coconut oil and applying on your skin can guard you against mosquitoes and other insect stings and bites. For pets, you can add 5 drops of Citronella oil to 8 ml of pet shampoo and make them feel fresh and flea-free for the entire day. “I use it when I shampoo my dog’s hair; 20 drops of Citronella added to 2 tablespoons of shampoo is very effective at killing fleas. He will be a happy dog with no fleas”, says Bryan Miller in the book Ayurveda and Aromatherapy. Insect repelling cartridges, candles, tablets and pellets for using in outdoor household areas are also available in the market with Citronella oil formula. The University of Maryland Medical Center study on ‘Insect bites and stings’ talks about a study where “citronella candles reduced the number of female mosquitoes caught in traps by 35%; linalool candles reduced female mosquitoes by 65%; and geraniol candles reduced female mosquitoes by 82%”. Citronella essential oil has citronellal, linalool and geraniol content in it, thus making it the most effective insect repellent on earth. A 2008 study on ‘Characterization and mosquito repellent activity of Citronella oil nanoemulsion’ by the National Science and Technology Development Agency, Thailand published in PubMed suggested that Citronella oil showed a release rate that related well to the protection time, contributing to a prolonged mosquito protection time. 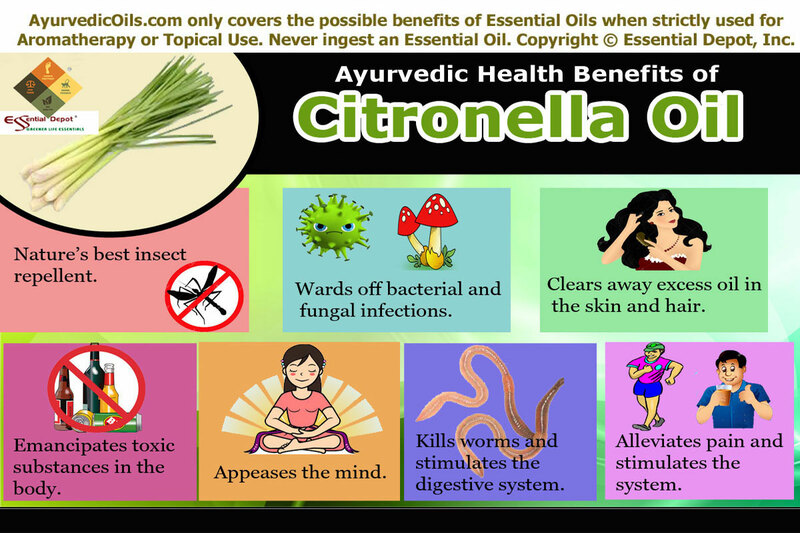 Citronella is a proven antibacterial oil with the presence of remedial constituents like methyl isoeugenol. It works by restricting the growth of existing bacteria causing infections and curtailing the spreading or growth of new bacteria. Massaging your system with 10 drops of Citronella oil blended with 10 ml of olive oil can be effective in treating bacterial infections in the stomach, kidneys, liver, intestines, prostate, bladder, colon and the urinary passages. The antifungal property of Citronella oil makes it a trusted natural remedy in combating the fungal infections like athlete’s foot, candida, dandruff and ringworm. Adding 2 drops of Citronella oil in warm bathing water can be of great assistance in treating external fungus problems in fingers, skin, toes and scalp and also effective in treating internal fungus infections causing fungal dysentery, vaginal infections, lung growth caused by weakened resistance and certain other health conditions. The essential oil of Citronella is a skin-friendly and hair-friendly oil that is often overlooked mainly because of its growing importance as a natural insect repellent. 2 drops of Citronella oil added to 1 ml of jojoba oil or to your mild skin care cream or lotion can help in cleansing the skin, removing excess oil secretion, nourishing the skin cells from within, moisturizing the skin, tightening the pores, enhancing the skin complexion and leaving it soft and supple. The fresh, clean and lemony aroma of Citronella oil comes as an esteem to your shampoo, as it aids in controlling dandruff with its anti-fungal properties, kills lice with its insecticide properties and removes excess oil from your oily hair and leaves a touch of absolute moisture in case of dry hair. Mix 5 to 6 drops of Citronella oil in 8 to 10 ml of mild shampoo and apply it gently on your scalp and hair. Leave it for 5 minutes and rinse thoroughly for a never before shiny, clean and lustrous hair. The detoxifying and diuretic properties of Citronella essential oil acts as an excellent aid in eliminating toxic remains left behind due to indigestion, unclean environment and other unhealthy lifestyle practices. These toxic substances are called as ama in Ayurveda and are the major reason behind numerous health conditions like arthritis, rheumatic pain, sluggishness, nervous exhaustion, fatigue, urinary infections and even severe heart problems. Massaging the painful, inflamed or affected parts of the body with 5 drops of Citronella oil blended with 3 ml of sesame oil can assist in reducing inflammation, discharging of toxic substances, uric acid, excess fat deposits and water stagnation in the body through sweat and urine. You can also add 3 to 4 drops of Citronella oil in hot or cold compress and massage the aching parts for quick relief. Ayurvedic texts state that only 20 to 30% of toxic substances in the body get discharged through urine and sweat and about 70% of harmful toxins are released only through exhalation. So deep breathing with slow inhalation along with slow and steady exhalation can be a sure shot remedy in expelling detrimental toxins in the body and this breathing exercise in known as Pranayama. The fruity, woody and citrusy aroma of Citronella essential oil instills calmness and warmth on your mind, body and spirit. Conflict of thoughts and perceptions are often the reason of stress, frustration and depression. Inhaling Citronella oil added to a diffuser or vaporizer (3 drops) has the power to grant mental clarity by pacifying the mental and emotional bodies that aids in determining the inner reasons for conflict. Spiritually, Citronella essential oil has a positive impact on the Solar plexus chakra known as ‘Manipura’ in Sanskrit. This chakra is responsible for courage, self respect, ambition, self esteem and self discipline. Massaging your body with 10 drops of Citronella oil mixed with 10 ml of virgin Olive oil can assist in releasing the energy of distrust responsible for aggravation, loneliness and disharmony between the self and society. Worms and parasites in the stomach and intestines hinder the normal metabolic functions and lead to delayed physical and mental activities of the body. 2 drops of Citronella oil added to diffuser or vaporizer along with massaging your abdomen with 5 drops of this oil mixed with 3 ml of sesame oil can assist in killing intestinal worms and parasites and stimulate the normal functioning of the digestive system and enhancing the process of absorption of essential nutrients in food, toning the lining muscles of stomach and intestines and supporting the process of excretion. Citronella essential oil has tonic properties that support and strengthen the nervous system, digestive system, excretory system and the endocrine system. By this way, massaging your body with 10 drops of Citronella oil blended with 10 ml of coconut oil can help in enhancing the immune power, hormone secretion, brain functions and blood circulation. This also helps in relieving pain including arthritic pain, migraine, rheumatic pain, muscular and joint pain, dysmennorhea, back pain and headache. Citronella essential oil is also used in spritzers, aroma lamps, aromatic candles and room fresheners along with Eucalyptus, Lemon and Lavender essential oil for disinfecting, purifying and deodorizing the surroundings, making it an insect-free environment. This information is for educational purposes only. Details enclosed here are an endeavor to maintain traditional wisdom and understanding. Do not use this for diagnosing or replacing any professional medical advice or prescribed medication. Always consult your Ayurvedic practitioner/ healthcare expert before choosing the right essential oils according to your medical condition and unique individual constitution. Never use essential oils internally, including Citronella oil as it has aldehyde content. Always dilute it in appropriate carrier oils or other liquids before using it for topical applications, as organic and pure essential oils are the life forces of plants and are extremely concentrated substances. Care should be taken in using Citronella oil if you are pregnant or a nursing mother. The MSDS (Material Safety Data Sheet) of Citronella oil is readily available for your enhanced safety and better usage. Gas Chromatography Report (GC analysis) of Citronella oil. GC tested to ensure purity and authenticity. This entry was posted in Essential Oils - Learn About and Purchase and tagged Ayurvedic detox oils, Ayurvedic oils for arthritis, Ayurvedic oils for bacterial infections, Ayurvedic oils for dandruff, Ayurvedic oils for digestive system, Ayurvedic oils for fungal infections, Ayurvedic oils for lustrous hair, Ayurvedic oils for oily skin, Ayurvedic oils for rheumatic pain, Ayurvedic oils for worms and parasites, Ayurvedic remedies for mental clarity, Ayurvedic remedies for skin problems, Ayurvedic uses of Citronella essential oil, Chemical constituents of Citronella Oil, Citronella essential oil, Citronella in Ayurveda, Cymbopogon nardus, Essential oils for detoxification, Gas Chromatography report of Citronella oil, Health benefits of Citronella essential oil, MSDS report of Citronella oil, Natural insect repellents, Pangiri, Pranayama, Safety data sheet of Citronella oil, Therapeutic properties of Citronella Oil by AyurvedicOils. Bookmark the permalink. This Article and all other content on AyurvedicOils.com is Copyright © 1995-2017 Essential Depot, Inc. All rights reserved. Do not copy. AyurvedicOils.com contains articles on many medical topics; however, no warranty whatsoever is made that any of the articles are accurate. There is absolutely no assurance that any statement contained or cited in an article touching on medical matters is true, correct, precise, or up-to-date. Even if a statement made about medicine is accurate, it may not apply to you or your symptoms. The medical information provided on AyurvedicOils.com is, at best, of a general nature and cannot substitute for the advice of a medical professional (for instance, a qualified doctor/physician, nurse, pharmacist/chemist, and so on). Derek G. Hodges and no one associated with Essential Depot, Inc. is a doctor or medical professional. Nothing on AyurvedicOils.com should be construed as an attempt to offer or render a medical opinion or otherwise engage in the practice of medicine.